Business Launch Group buy event !!! We would like to extend a group buy to the motorcycling community on this new and exciting camping equipment brand. We are offering a launch price of 20% off retail + no tax and free local delivery(GTA, Orangeville and Guelph areas) to our 20 first customers on 7 lightweight and ultra-light tents that can be packed in hard cases or in a trailer. Visit www.luxeoutdoor.ca for more information. If interested, a 50% deposit (cash or EMT only)will be requested to secure your order. The balance will be due on delivery, approximately two weeks after the group buy closes on May 30 , 2014. The date of delivery is 100% decided by Canada Post and CBSA, therefore delays are out of our control. Once the shipment is in, we will contact everyone and schedule a delivery time and date which is convenient for you, our first customers! A small shipping charge will apply for buyers outside of the GTA, Orangeville or Guelph areas. Ride through the Forks to get here! The first show-and-tell event is tomorrow! Ride your bike, hot beverages and pastries will be served! Thank you everyone for showing up, this was a successful event! There is still some time to get in the group buy. Come see us this upcoming wednesday night in the Bayview Village area! Tents will be on display and snacks/refreshments will be served! What's so special about these tents? Luxe Outdoor Canada sells and distributes light and ultra-light camping equipment. The quality of our products is equal or superior to what can be found in specialized outdoor equipment shops for a lower price point. The tents and sleeping bags pack quite small and fit in GIVI-style cases quite nicely. That makes them the perfect gear to take along on motorcycle camping trips. The condo is located across the street from Chapters at Bayview Village, ample parking is available there. The party room entrance is located at street level . Look for the yellow Luxe Outdoor signs! We hope that this answered your question. If you have more questions about our products, you can PM, phone or e-mail us and we’ll be glad to assist you! P.S. : Our equipment is also perfect for backpacking, canoeing, hiking, hunting, or family camping! 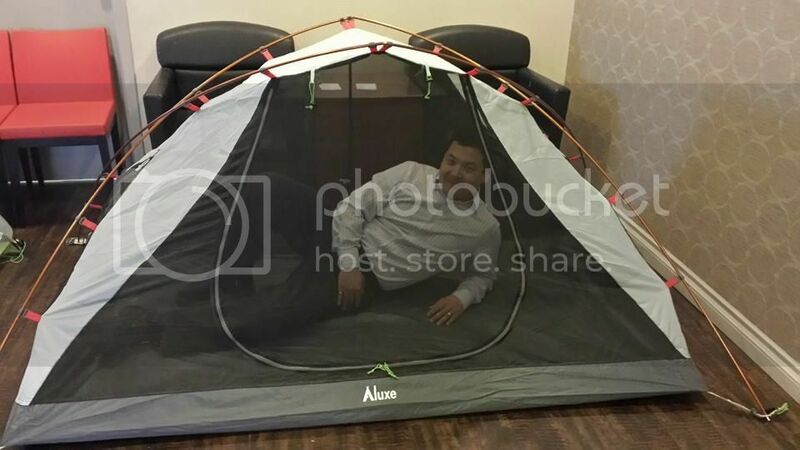 Do you sell the Hammock type tents? We do not carry hammock tents, however we have in stock a tarp, called the Batwing 500S, that you can come and see this upcoming Wednesday. As the tarp is not part of the group buy, you can purchase it and take it home that night. Everything that we have for sale, at this moment, is posted on our website www.luxeoutdoor.ca . We are inviting you to visit the site and get acquainted with our great products! Tonight is our second event, held at a convenient location in North York. Lights snacks and refreshments will be served, be sure to drop-in to learn about our exciting line of products! The party room entrance is located at street level , on the corner of the building and there will be signs posted to help you locate it. Please call (416) 884-8489 if you have difficulties finding the entrance as the front desk will not be able to assist you. Can you please post pictures/dimensions of it packed up? All the 7 tents listed above are listed on our website (luxeoutdoor.ca) with a full set of pictures and dimensions including the dimensions of it packed. If there is a specification we have missed that you are looking for, we will do our best to find the information you are looking for to help you or anyone else out. Thank you everyone for dropping by yesterday and learning about our products. There is still space to buy at a discounted price! For those who cannot attend the special events, we accept deposits by EMT!!! We will mail out a receipt. This is a quick reminder that our third event is TODAY! You can get to Luxe's headquarters by riding through the Forks of the Credit!!! In Belfountain, head west on Bush Street. At the end of the road, turn right, then left at the lights. At the Petro Canada gas station, turn right then left at the Timbr-mart. This week-end is the last chance to see our products before our order on May 30th. If those times aren't convenient, we can arrange something else. I had a chance to view the tents at one of their demonstration nights and I was impressed with the quality and price. If this group buy was a few years ago when I was shopping for a tent, I would've totally bought one and saved at least $100 off my North Face tent 2 person tent. I spent the most time looking at the "Hammer II" model. The tent is mostly mesh, so it will keep you cool on the hottest nights while you laugh at the bugs from the inside. The fly (not pictured) has a huge vestibule, large to keep the rain off all your gear. Note you will need some soft ground to put the pegs into to setup the fly and vestibule. Hammer II -2p Retail $ 304.95 Group Buy $240 Deposit $ 120. Wobblycat not included. Stuff is the bars of the prisons we lock ourselves in.